During antimicrobial treatment of classic Whipple’s disease (CWD), the chronic systemic infection with Tropheryma whipplei, immune reconstitution inflammatory syndrome (IRIS), is a serious complication. The aim of our study was to characterize the immunological processes underlying IRIS in CWD. Following the definition of IRIS, we describe histological features of IRIS and immunological parameters of 24 CWD IRIS patients, 189 CWD patients without IRIS, and 89 healthy individuals. 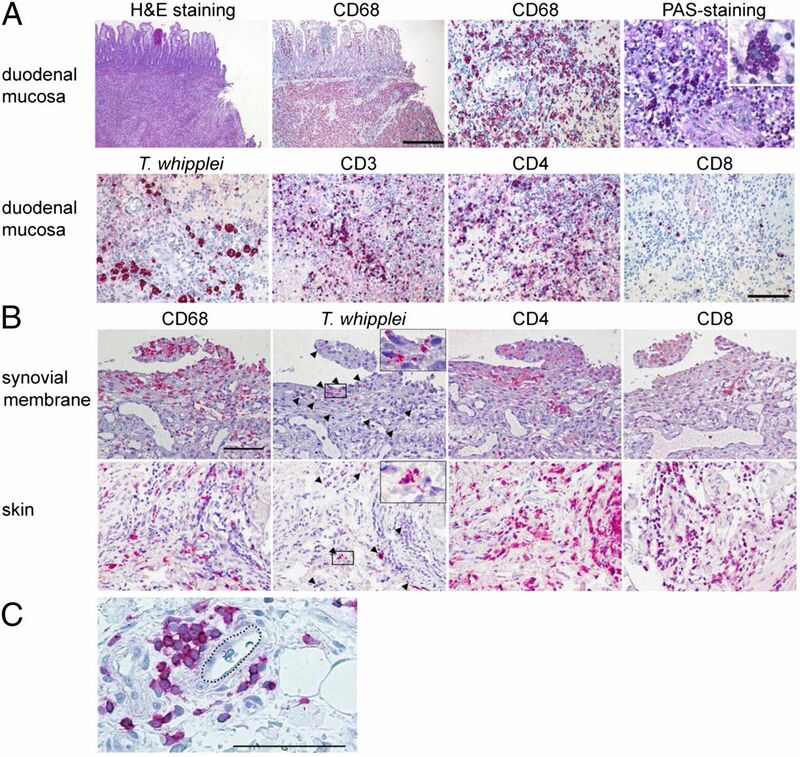 T cell reconstitution, Th1 reactivity, and the phenotype of T cells were described in the peripheral blood, and infiltration of CD4+ T cells and regulatory T cells in the duodenal mucosa was determined. During IRIS, tissues were heavily infiltrated by CD3+, predominantly CD45RO+CD4+ T cells. In the periphery, initial reduction of CD4+ cell counts and their reconstitution on treatment was more pronounced in CWD patients with IRIS than in those without IRIS. The ratio of activated and regulatory CD4+ T cells, nonspecific Th1 reactivity, and the proportion of naive among CD4+ T cells was high, whereas serum IL-10 was low during IRIS. T. whipplei–specific Th1 reactivity remained suppressed before and after emergence of IRIS. The findings that IRIS in CWD mainly are mediated by nonspecific activation of CD4+ T cells and that it is not sufficiently counterbalanced by regulatory T cells indicate that flare-up of pathogen-specific immunoreactivity is not instrumental in the pathogenesis of IRIS in CWD. Classic Whipple’s disease (CWD) is defined as a chronic infection with Tropheryma whipplei that evolves in immunologically predisposed hosts (1). Major clinical symptoms are arthropathies and gastrointestinal signs that can be treated effectively with antimicrobials (2). However, in ∼10% of CWD patients receiving antibiotics, the immune reconstitution inflammatory syndrome (IRIS) has been described (3). Immunosuppressive treatment before diagnosis of CWD has been recognized as a major risk factor for IRIS in CWD (3). IRIS has been defined clinically as a paradoxical flare-up of inflammatory signs and symptoms beginning after initiation of effective antimicrobial treatment. It was first described in HIV-infected patients, arising after antiretroviral therapy (ART) (4, 5). Later, IRIS was also observed in other patients, suffering from leprosy or tuberculosis, and in transplant recipients in whom a period of immunosuppression was followed by rapid immune reconstitution (6–9). The underlying pathophysiology has not been characterized sufficiently to date, but a low CD4+ cell count before initiation of antimicrobial treatment is an accepted risk factor of IRIS (4, 5, 7, 10). Rapid restoration of T cell numbers seems to be a major mechanism (4), and IRIS has been attributed to underlying opportunistic infections (4–6, 8) and a high pathogen load (11, 12). In addition, IRIS appears to be promoted by enhanced activation of CD4+ T cells (10, 13, 14) and increased inflammatory cytokine production (10). Although the numbers of regulatory T cells (Tregs) seem not to be reduced during IRIS (10), it might be favored by a weak activity of Tregs (15) and low IL-10 serum concentration (16). It is not known whether the sudden conversion from an immunocompromised to a proinflammatory state observed in IRIS results from reactivation of Ag-specific immune responses or represents a general immune activation or a combination of both. IRIS in CWD comprises an excellent model to address the issue of Ag specificity and immunological mechanisms of IRIS in general: 1) immunological aberrations indicate transient immunosuppression during active CWD (17–21), 2) the pathogen can be effectively eradicated and the major clinical manifestations of CWD resolve upon antimicrobial treatment (2), 3) CWD patients do not suffer from opportunistic infections (22), and 4) a persistent lack of T. whipplei–specific T cell reactivity is a hallmark of this disease (19). Therefore, specific immune responses to the etiologic agent or to opportunistic pathogens do not interfere with the immune activation during IRIS. This investigation aimed to analyze underlying immunological mechanisms of IRIS in patients with CWD. For this purpose, we investigated the immunohistochemical features in affected tissues and in the peripheral immune system in CWD patients with IRIS (3), and compared the results with those from control groups consisting of CWD patients without IRIS and healthy volunteers. For this study, blood and tissue specimens were collected prospectively at diagnosis before initiation of antimicrobial treatment for CWD. Depending on the course of the disease, patients were retrospectively allocated to the group of CWD patients not developing IRIS (non-IRIS CWD patients) or to the group of CWD patients developing IRIS (CWD IRIS patients). Paired specimens were collected from non-IRIS CWD patients when CWD symptoms dissolved and from CWD-IRIS patients when IRIS was manifest; some of them were at low-dose treatment with steroids at that time (see Supplemental Table I). Successful antimicrobial treatment of all CWD patients included was guaranteed by a negative tissue PCR and the histological score of duodenal biopsies (3). Immunological data from CWD IRIS patients were compared with the data from non-IRIS CWD patients and from control subjects without CWD from the Medical Clinic I, Campus Benjamin Franklin, Charité-Universitätsmedizin Berlin, Berlin, Germany. The reference values of non-IRIS CWD patients and control subjects for CD4+ and Foxp3+ counts in the duodenal mucosa (see Fig. 2), for IL-10 serum concentration and Staphylococcus enterotoxin B (SEB) stimulation of whole blood (see Fig. 4), and for CD25+Foxp3+ CD4+ T cells in the peripheral blood (Supplemental Fig. 1) have been published before describing the immunological features of non-IRIS CWD patients (17, 21) (for details, see the figure legends). Because this investigation is based on paired samples of blood and tissues, values may vary to some extent from previously published unpaired ones (17, 21). The study was approved by the Charité-Universitätsmedizin Berlin Institutional Review Board, and all participants provided informed consent to study participation in accordance with the Declaration of Helsinki. A total of 213 CWD patients were treated in the European Cooperative Study. Of these, 24 were diagnosed with IRIS (11.3%). All patients were treated effectively with antimicrobials. The majority received i.v. ceftriaxone followed by oral trimethoprim/sulfamethoxazole (TMP/SMX) (2). One patient was treated with TMP/SMX alone, another with ampicillin followed by TMP/SMX. Recurrence of the infection with T. whipplei could be excluded in all treated patients because of the fact that T. whipplei–specific tissue PCR was negative in manifest IRIS and because CWD did not reoccur during a median follow-up period of 52.5 mo. A detailed description of the clinical manifestations of 16 of the 24 CWD IRIS cases was the subject of a previous publication (3). The eight additional CWD IRIS patients presented similar IRIS manifestations: fever (n = 7), recurrent arthritis (n = 4), recurrent gastrointestinal symptoms (diarrhea and abdominal pain, to the point of gut perforation) (n = 3), and skin irritation (n = 1). Clinical presentation at diagnosis is summarized in Table I. Immunosuppressive treatment before CWD diagnosis was associated with the occurrence of IRIS (Table I). Specimens were collected for technical reasons only from a fraction of unselected patients who were available for sampling. Peripheral blood was collected from 57 non-IRIS CWD patients (10 women, 47 men; median age at diagnosis, 58 y, range 34–75 y), from 16 CWD IRIS patients (3 women, 13 men; median age at diagnosis, 55 y, range 42–69 y), and 89 age-matched subjects with no signs of CWD (45 women, 44 men; median age 50 y, range 35–79). Biopsy specimens from the duodenal mucosa were obtained from 15 CWD IRIS patients (3 women, 12 men; median age, 61 y, range 42–74 y) and 21 non-IRIS CWD patients (4 women, 17 men; median age, 62 y, range 46–66 y) before and after antimicrobial treatment. Control biopsy specimens were obtained from 27 subjects without CWD during control endoscopy for gastric ulcer disease (11 women, 16 men; mean age, 46 y; range 24–72 y). Tissue affected by CWD IRIS from the skin (2×), the synovial membrane of the knee (2×), and the ileum were obtained by surgery. T. whipplei–specific PCR was performed from fresh and paraffin-embedded specimens as described previously (3). A negative PCR result indicated absence of T. whipplei or numbers below the detection level. Tissue was fixed in formalin, embedded in paraffin, and stained with periodic acid–Schiff (PAS) reagent and H&E according to routine procedures. Immunostaining was performed on paraffin sections as described previously (21). Primary Ab against human CD4 (clone 1F6; Novocastra, Newcastle, U.K.), CD3 (clone F7.2.38), CD8 (clone C8 144B), CD45RO (clone UCHL 1), CD45RA (clone 4KB5), or CD68 (clone PG-M1; all from DAKO, Hamburg, Germany) were followed by donkey anti-mouse biotin (Dianova, Hamburg, Germany), primary Ab against T. whipplei (polyclonal rabbit Ab) (23) was detected by donkey anti-rabbit biotin (Dianova), and rat anti-human FOXP3 (clone PCH101; eBioscience, San Diego, CA) was followed by rabbit anti-rat biotin (Jackson Immunoresearch, West Grove, PA). Biotin was visualized with streptavidin-alkaline phosphatase and Fast Red (both from DAKO). Cell counts were determined from three biopsies per sampling date as the mean cell count of 10 high-power fields of 0.237 mm2 each. Percentage of CD45RA+ and CD45RO+ were calculated from the sum of CD45RA+ and CD45RO+ cells. To determine absolute numbers of T cells and Tregs in peripheral fresh whole blood, TruCount tubes (BD Biosciences, Heidelberg, Germany) were used for FACS analysis. Because this analysis permits only surface staining and no fixation or permeabilization of specimens before staining, CD25 was used to characterize Tregs. CD3+, CD3+CD8+, CD3+CD4+, CD3+CD4+CD25+, and CD3+CD4+CD25high T cell numbers were determined using CD3/CD4/CD8 TriTest and mouse anti-human CD25 (clone 2A3; all from BD Biosciences) according to the manufacturer’s protocol as described previously (17). CD25highCD4+ T cells were designated as Tregs, and CD25+CD4+ T cells minus CD25highCD4+ T cells as activated T cells (Supplemental Fig. 1A). Compared with the analysis of FOXP3+CD25+ CD4+ T cells in fresh peripheral lymphocytes, our strategy for TruCount measurement of fresh whole blood resulted in slightly reduced numbers of Tregs (Supplemental Fig. 1B). However, these differences were similar for healthy control subjects and CWD patients (Supplemental Fig. 1B). The phenotype of T cells from peripheral blood and synovial fluid was determined by seven-color FACS analysis as described previously (17) with the following Abs: mouse anti-human CD4 (clone RPA-TA), CD25 (clone M-A 251), CD45RO (clone UCHL1), CD31 (clone WM59), Fas (CD95, clone DX2), CCR6 (CD196, clone 11A9), CCR7 (CD197, clone 3D12), and β7-chain of integrin (clone FIB504; all from BD Biosciences), and CD45RA (clone HI100) and FOXP3 (PCH101) (both from eBioscience). Data acquired on a FACSCalibur or a FACS Canto II device were analyzed with CellQuest (all from BD Biosciences) and FlowJo (Tree Star, Ashland, OR) software. Gates were set on CD3+ T cells for TruCount analysis, and on lymphocytes and CD4+ T cells for phenotyping. To determine the reactivity of CD4+ T cells and their capacity to produce IFN-γ, whole blood and mononuclear cells from synovial fluid were stimulated with SEB (2 μg/ml; Sigma, Taufkirchen, Germany) and lysate of heat-killed T. whipplei Twist-Marseille (107 CFU/ml) for 6 h (24) followed by analysis of IFN-γ+CD154+ cells of CD4+ T cells with Abs against human CD3 (clone SK7), CD4 (clone RPA-T4), IFN-γ (clone B27), and CD154 (clone TRAP1; all from BD Biosciences) by FACS as described earlier (19). IL-10 concentration in the serum was quantified using a cytometric bead array (BD Biosciences) according to the manufacturer’s protocol. For comparative analysis of continuous variables, paired t test and Mann–Whitney U test were used. The clinical parameters obtained from patients with IRIS and from control subjects without IRIS were compared with the Fisher test. The p values were two sided, and p < 0.05 was considered significant. The 95% confidence intervals (CIs) for single proportions were calculated with the binomial exact test, using the normal approximation to t tests for means. In one patient with perforation of the ileum, the tissue of resected gut revealed substantial cell infiltrations (Fig. 1A). Although the mucosa itself was only modestly infiltrated, the infiltrate in the muscular layers was intense. The integrity of the smooth muscle layer was partially destroyed by a transmural infiltrate mainly consisting of granulocytes and of foamy PAS+ CD68+ macrophages containing T. whipplei remnants (Fig. 1A). PAS+ macrophages were accompanied by infiltrating T cells, mainly by CD4+ T cells, but only a few CD8+ T cells (Fig. 1A). Histological examination of resected ileum and biopsies of the synovial membrane and the skin affected by CWD IRIS. (A) Ileum with low-power magnification of a transmural infiltrate after H&E staining, positive immunohistochemical stainings appearing in red for CD68+ cells, PAS+ cytoplasmic particles with an inset showing sickle-like particles, positive immunohistochemical staining appearing in red for T. whipplei bacteria, CD3, CD4, and CD8. Scale bar for low-power magnification, 1000 μm; scale bar for higher magnifications, 200 μm. (B) Biopsies of the synovial membrane and the skin affected by IRIS in CWD IRIS patients with infiltrates of CD68+ macrophages, remnants of T. whipplei (arrowheads), and CD4+ and CD8+ T cells stained in red by immunohistochemistry. Scale bar, 200 μm. (C) CD4+ T cells surrounding a capillary are indicated by a dashed line. Scale bar, 200 μm. The inflammatory changes in synovial membrane and skin were similar. The tissue was infiltrated by CD68+ macrophages, remnants of T. whipplei, and focally by CD4+ T cells and, to a lesser extent, by CD8+ T cells (Fig. 1B). Accumulations of CD4+ T cells in the vicinity of capillaries may indicate transendothelial migration (Fig. 1C). During CWD IRIS, initially low counts of CD4+ T cells in the lamina propria significantly increased after successful antibiotic treatment, reaching levels observed in healthy control subjects (Fig. 2A). The total CD4+ T cell count in treated CWD IRIS patients was significantly increased compared with that of non-IRIS CWD patients (Fig. 2A). Before treatment, and despite the frequent previous immunodippressive treatment (Table I), the numbers of Treg cells in the lamina propria of CWD patients subsequently developing IRIS were lower than in the non-IRIS CWD group (Fig. 2A); they did not change during or after antibiotic treatment and were in the same range as in healthy control subjects (Fig. 2A). T cell reconstitution in duodenal mucosa and blood of CWD IRIS patients. (A) Individual values and median with interquartile range of CD4+ T cells and Tregs, in paired specimens of the lamina propria of the duodenum of non-IRIS CWD and CWD IRIS patients before and after antimicrobial treatment compared with healthy control subjects (solid lines indicate median; dashed lines indicate 25 and 75 percentiles). Reference values of numbers of CD4+ T cells and FOXP3+ T cells per high-power field of non-IRIS CWD patients (unpaired specimen) and 53 healthy control subjects were published previously (17, 21). 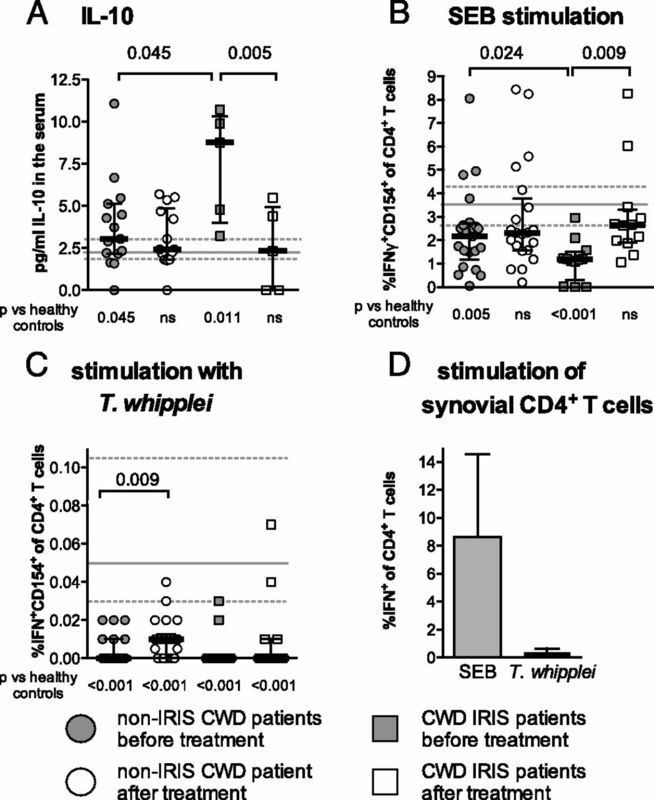 (B) Reconstitution of peripheral T cells in CWD IRIS. Individual values and median with interquartile range of CD3+, CD4+, and CD8+ T cells in paired specimens of peripheral blood of non-IRIS CWD and CWD IRIS patients before and after antimicrobial treatment compared with healthy control subjects (solid line indicates median; dashed lines indicate 25 and 75 percentiles). Absolute numbers of CD3+ and CD4+ T cell percentages of CD4+ and CD8+ T cells are given. Reference values were from 89 healthy control subjects. The p values as determined by paired t test within a patient group and Mann–Whitney U test between patients and control subjects, respectively. (C) CD4+ T cell count in the peripheral blood of CWD IRIS patients with continuos immunosuppression before diagnosis of CWD in relation to treatment duration and linear regression. Compared with healthy subjects, numbers of circulating CD3+ and CD4+CD3+ T cells were significantly reduced in all CWD patients before initiation of antimicrobial treatment. After treatment, these values returned to the normal range (Fig. 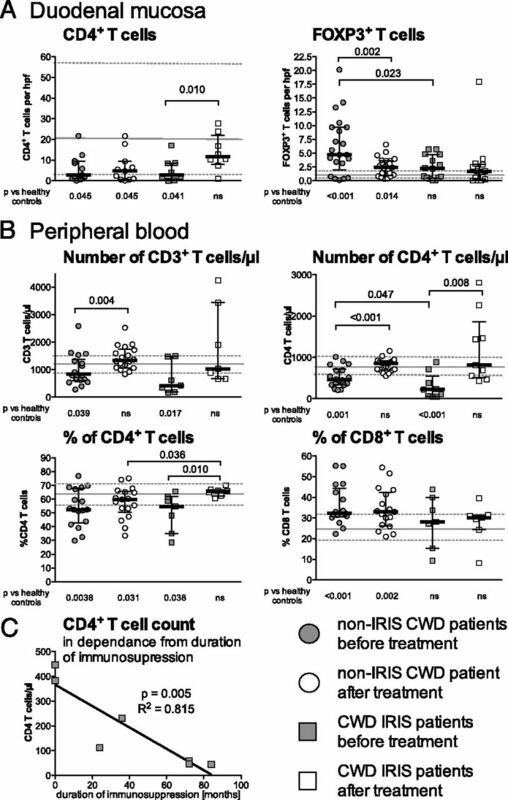 2B, upper panel), whereas similar to CD4+ cells in the duodenal mucosa, peripheral baseline CD4+ T cell numbers were significantly reduced in CWD IRIS patients (Fig. 2B; median of 226 versus 461 CD4+ T cells/μl; p = 0.047). Compared with the non-IRIS CWD control group, these CD4+ cells counts increased significantly in CWD IRIS patients after treatment for CWD (Fig. 2B). Although CD8+ T cell counts increased in both patient groups, no difference was observed in the extent of increase in both CWD groups and when compared with the number of CD8+ T cells in healthy control subjects (data not shown). The percentage of CD8+ cells within the T cell population did not change in either CWD group after antibiotic treatment (Fig. 2B). The duration of immunosuppressive treatment before diagnosis of CWD was negatively correlated with the number of CD4+ T cells in the peripheral blood (Fig. 2C). As for their potential systemic impact, we next focused on peripheral CD25highCD4+ Tregs and on activated CD4+ T cells designated as CD25+CD4+ T cells for their low or medium expression levels of the IL-2R α-chain. Analyses were performed with surface stainings of whole-blood specimens in TruCount tubes to determine absolute cell numbers. The percentage of activated CD4+ T cells was increased in non-IRIS CWD patients before treatment, and it declined significantly thereafter to values below those of healthy subjects (Fig. 3A). In CWD patients developing IRIS, the percentage of activated CD4+ T cells, however, was elevated compared with healthy subjects and remained at this level (Fig. 3A), whereas the total number of activated CD4+ T cells increased significantly in CWD IRIS patients after treatment when compared with all other groups (Fig. 3B). Peripheral activated CD25+CD4+ T cells and CD25highTregs in CWD patients before and after antimicrobial treatment. T cell populations were compared in paired specimens of peripheral blood of non-IRIS CWD and CWD IRIS patients before and after antimicrobial treatment compared with healthy subjects (individual values and median with interquartile range of CWD patients; solid gray lines indicate median; dashed gray lines indicate 25 and 75 percentiles of reference values from 81 healthy control subjects). Percentage (A) and absolute numbers (B) of activated CD25+CD4+ T cells. (C) Percentage of CD25highTregs (reference values of healthy subjects and CWD patients in unpaired cohorts were published previously ). (D) Ratio of absolute numbers of activated CD25+CD4+ T cells and CD25highCD4+ Tregs. The p values were determined by paired t test within a patient group and Mann–Whitney U test between patients and control subjects, respectively. In contrast with activated T cells, the percentage of peripheral blood Tregs in CWD IRIS patients decreased significantly in CWD IRIS patients after treatment when compared with non-IRIS CWD patients and healthy subjects (Fig. 3C). The ratios of the numbers of activated CD4+ T cells and CD25highCD4+ Tregs in CWD IRIS patients compared with non-IRIS CWD patients showed a reverse course (Fig. 3D). Upon treatment, an initially high proportion of activated T cells declined significantly in non-IRIS CWD patients, whereas in CWD patients subsequently suffering from IRIS, the proportion of activated T cells increased to a level considered elevated when compared with control subjects. Compared with non-IRIS CWD patients and healthy control subjects, the concentration of IL-10 in sera of CWD patients developing IRIS was significantly elevated but had decreased significantly at the time IRIS was manifest (Fig. 4A). (A–C) Concentration of IL-10 in the serum and coexpression of IFN-γ and CD154 in peripheral blood CD4+ T cells after stimulation with SEB and T. whipplei. Values of paired specimens of CWD IRIS patients and non-IRIS CWD patients before and after antimicrobial treatment were compared with healthy control subjects (individual values and median with interquartile range of CWD patients; solid gray lines indicate median; dashed gray lines indicate 25 and 75 percentiles of reference values from healthy control subjects). (A) Serum concentration of IL-10 [unpaired values of non-IRIS CWD patients and from 52 healthy control subjects were previously published (21)]. (B) Expression of IFN-γ and CD154+ by CD4+ T cells after stimulation with SEB [unpaired values of non-IRIS CWD patients and values from 32 healthy control subjects were previously published (17)]. (C) Percentage of IFN-γ+CD154+ of CD4+ T cells from peripheral blood after stimulation with T. whipplei (reference values from 32 healthy control subjects). (D) Median with range of the percentage of IFN-γ+CD154+ of CD4+ T cells from the synovial fluid of two CWD IRIS patients after stimulation with T. whipplei and SEB. The p values were determined by paired t test within a patient group and Mann–Whitney U test between patients and control subjects, respectively. The production of IFN-γ by activated CD154+CD4+ T cells on stimulation with SEB in patients who later developed IRIS was lower than in control subjects and in non-IRIS CWD patients (Fig. 4B). During antibiotic treatment for CWD, the percentage of CD154+CD4+ T cells expressing IFN-γ on SEB stimulation remained unchanged in non-IRIS CWD patients (data not shown) but increased significantly in CWD IRIS patients (Fig. 4B). The production of IFN-γ by CD154+CD4+ T cells from peripheral blood as a specific memory response to stimulation with T. whipplei Ags was significantly reduced in CWD patients developing IRIS compared with healthy control subjects, and it remained absent in all non-IRIS CWD and CWD IRIS patients (Fig. 4C). Corresponding to peripheral blood, T. whipplei–specific Th1 reactivity did not contribute to the manifestation of IRIS in synovial fluid. The reaction to SEB greatly exceeded the T. whipplei–specific reactivity, also in CD4+ cells from synovial fluid in patients with IRIS manifesting as recurrent arthritis (Fig. 4D). The distribution of CD4+ subpopulations was analyzed in the periphery and in local samples (synovial fluid and tissue) from CWD IRIS patients to study the quality of CD4+ T cell reconstitution. In peripheral blood of CWD IRIS patients, the percentage of naive CD45RA+CCR7+CD4+ T cells was elevated, whereas the percentage of memory CD45RA−CD4+ T cells was reduced (Fig. 5A). 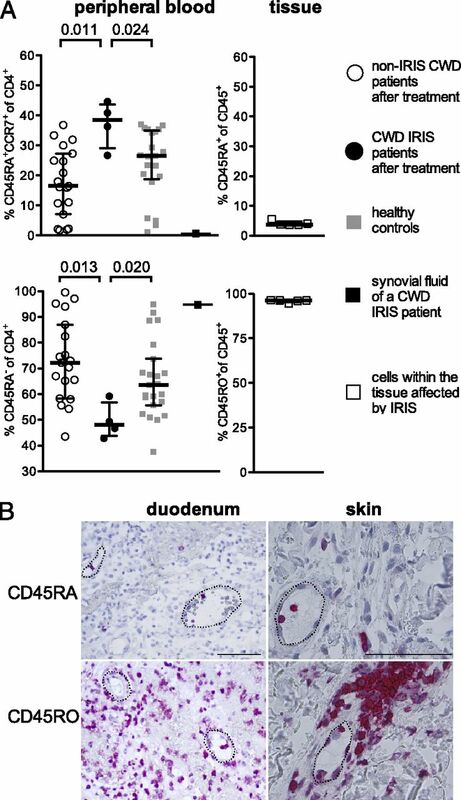 In contrast with peripheral blood, CWD IRIS patients harbored a high percentage of memory and a low percentage of naive CD4+ T cells in the synovial fluid, the synovial membrane, the skin, and the duodenal mucosa (Fig. 5A, 5B). In the duodenal mucosa and skin tissue, the percentage of memory CD45RO+ T cells greatly exceeded the percentage of naive CD45RA+ T cells among all CD45+ T cells, particularly as a high proportion of the CD45RA+ T cells was located inside capillaries (Fig. 5B). Peripheral and local restoration of naive and memory CD4+ T cells. Values of the peripheral blood and tissues affected by IRIS (synovial fluid; synovial tissue [2×], skin [2×], and duodenal mucosa [1×]) of CWD IRIS patients after antimicrobial treatment were compared with the values of non-IRIS CWD patients after antimicrobial treatment and healthy control subjects. (A) (upper panel) Percentage of naive CD4+ T cells in peripheral blood and synovial fluid (CD45RA+CCR7+) and in tissue (CD45RA+); (lower panel) percentage of memory CD4+ T cells in peripheral blood and synovial fluid (CD45RA−) and in tissue (CD45RO+). (B) Immunohistochemical staining of CD45RO+ and CD45RA+ T cells in the tissue of CWD IRIS patients (scale bars, 200 μm); (left panel) muscular layer of the duodenum; (right panel) skin (positive cells are stained red; dashed lines mark capillaries). The p values were determined by Mann–Whitney U test. In peripheral blood of CWD IRIS patients, the proportion of CD31+ cells observed in naive CD45RA+CCR7+ CD4+ T cells containing a certain proportion of recent thymic emigrants (25) and the percentage of memory CD4+ T cells expressing the inflammation-associated chemokine receptor CCR6 (Fig. 6A, 6B) was enhanced. The percentage of CD31+ cells among naive CD45RA+CCR7+ CD4+ T cells did not depend on age in CWD IRIS patients, whereas it was negatively correlated to age in healthy control subjects (r2 = 0.247, p = 0.016) and in non-IRIS CWD patients (r2 = 0.220, p = 0.043). Phenotype of naive and memory CD4+ T cells in peripheral blood of non-IRIS CWD patients and four CWD IRIS patients after antimicrobial treatment compared with healthy control subjects. (A) Percentage of CD45RA+CD31+CCR7+ recent thymic emigrants among CD4+ T cells in peripheral blood. (B) Percentage of CCR6+ cells among memory (CD45RA−) CD4+ T cells. (C) Percentage of CCR6+ integrin β7+ cells among memory (CD45RA−) CD4+ T cells. (D) Percentage of CD95+ of effector (CD25+FOXP3−) CD4+ T cells. The p values were determined by Mann–Whitney U test. The percentage of memory CD4+ T cells of peripheral blood expressing the inflammation-associated chemokine receptor CCR6 (Fig. 6B) and CCR6 in combination with the gut-homing marker integrin β7-chain was higher in CWD IRIS patients than in non-IRIS CWD patients (Fig. 6C). The percentage of effector CD25+FOXP3− CD4+ T cells expressing FAS (CD95) was lower in peripheral blood from CWD IRIS patients than in peripheral blood from non-IRIS CWD patients and healthy control subjects (Fig. 6D). The findings from our cohort of CWD IRIS patients support the concept that reconstitution of CD4+ T cells after antimicrobial treatment for CWD is characterized by effector T cell activation in the absence of efficient control by Tregs as a major element in the development of IRIS. We have demonstrated previously that CWD patients are more likely to develop IRIS when they received immunosuppressive treatment before diagnosis of CWD (3). This was confirmed by the results of this study. In addition, we demonstrate in this study that very low initial CD4+ T cell counts that increased significantly after treatment are a risk factor for CWD IRIS. This supports the idea that the conversion from immunosuppression to activation drives substantially the pathogenesis of IRIS, which is in agreement with IRIS in patients with HIV infection or in transplant recipients (4–7, 10). As reported for IRIS in HIV or non-HIV patients (10, 13–15), a high ratio of activated and regulatory CD4+ T cells reflects nonsuppressed CD4+ T cell activation also during CWD IRIS. In CWD patients subsequently developing IRIS, two additional findings are consistent with a status of general immunosuppression before initiation of antibiotic treatment: the concentration of the main anti-inflammatory cytokine IL-10 in serum, which was elevated before antimicrobial treatment, declined during the development of IRIS, and the generally reduced capacity to elicit Th1 cell responses before initiation of treatment was reestablished in IRIS. These observations agree with findings in the pathogenesis of IRIS in HIV- and non-HIV–infected patients (8, 10, 13). They are also in line with our previous observation that long-term immunosuppressive treatment before the diagnosis of CWD constitutes a major risk factor for the occurrence of IRIS by aggravating T cell dysfunction and CD4+ T cell depletion (3). In contrast with the immunosuppression during HIV infection that is mediated mainly by the loss of CD4+ T cells, a combination of immunosuppressive treatment and immunosuppression by T. whipplei results in the immunocompromised state of CWD patients at diagnosis that is not only characterized by low CD4 numbers and IFN-γ production, but also by a general anti-inflammatory milieu, enhanced activity of Tregs, alternative activation of macrophages, and high IL-10 production (17, 21). In this article, we demonstrated that local inflammation in CWD IRIS is characterized by predominant invasion of CD4+ T cells, which may participate in the tissue damage. In the duodenum, where T. whipplei is massively accumulated, CD4+ T cell reconstitution was not accompanied by an adequate repopulation with FOXP3+ Treg. Consequently, as shown in peripheral blood (15), insufficient counterregulation may permit the striking effector CD4+ T cell–mediated inflammatory reaction. In this context, immune regulation in the small bowel seems to be crucial for CWD IRIS. In contrast with intestinal mucosa of non-IRIS CWD patients, where we demonstrated more Tregs in the lamina propria before initiation of treatment (17), the mucosa of CWD patients later developing IRIS harbors only low Treg numbers. Low Treg cell numbers might facilitate local inflammation that impairs the integrity of the epithelial barrier and subsequently allows the translocation of luminal Ags (26). Consequently, a high systemic antigenic burden (14) may trigger inflammation in IRIS-related T cell repopulation. In peripheral blood of CWD IRIS patients, the excess of naive CD45RA+ T cells and the enhanced percentage of CD31+ cells that was independent of the age indicates restoration of the cellular immune system after antimicrobial treatment, although it does not allow a conclusion whether this is achieved by peripheral T cell proliferation or emerging thymus activity (25). These increased numbers of naive CD4+ T cells in the periphery constitute a main difference to IRIS in HIV infection, where memory T cells drive IRIS development during ART (14). In HIV infection, opportunistic infections favor memory T cell expansion, and de novo generation of pathogen-specific T cells during IRIS (27), additional persistent chronic immune activation, high Ag burden (28), and thymic exhaustion (29) possibly assist repopulation of the T cell pool by memory T cells during ART (30). In contrast, during CWD opportunistic infections, T. whipplei–specific T cell responses are absent (19, 22); thus, the major difference between CWD and other infections is that IRIS needs to be driven by pathogen-independent mechanisms. The assumption that low percentages of peripheral memory CD45RO+ T cells in CWD IRIS patients result from migration of memory CD4+ T cells to extravascular tissues rather than from impaired proliferation is based on the following observations: 1) memory CD4+ T cells represent the major cell population in tissues affected by IRIS, 2) CD4+ T cell numbers in the intestinal mucosa are higher in CWD IRIS than in non-IRIS CWD patients, and 3) peripheral memory T cells in CWD IRIS patients comprise an elevated proportion of CD4+ T cells with a CCR6+ integrin β7+ gut migration phenotype. Reduced CD95 expression on CD4+ effector T cells subsequently reduces the capacity for apoptosis of these cells and favors persistent local inflammation during CWD IRIS. Pathogen-specific T cell reactivity recovers after successful therapy in most cases with HIV infection, tuberculosis, and leprosy (31–33), whereas IRIS pathogenesis is considered to mainly occur in patients with high pathogen load (7, 11, 12). However, CWD IRIS supports the conclusion that pathogen-specific immune reconstitution is not a prerequisite for IRIS because: 1) CWD patients do not experience development of T. whipplei–specific T cell reactivity in peripheral blood before or after antimicrobial treatment; 2) pathogen-specific reactivity remains absent even at high T. whipplei burdens in tissues affected by IRIS; 3) IRIS affects the duodenal mucosa, the location of the major pathogen load in CWD, but also nongut loci; and 4) sites unaffected by IRIS reveal pathogen distribution comparable with adjacent tissue where IRIS manifests. A minor role for pathogen specificity and a more important impact of dysregulated innate immune reactions in IRIS pathogenesis have been discussed very recently (34). This perspective is supported by the fact that immunogenetic factors involved in Ag presentation influence the susceptibility to CWD IRIS (35), and that IRIS in CWD has been successfully treated with thalidomide (36), supposedly by downregulating TNF-α expression. Obviously, our study has limitations. Because the number of observations is very small, a prospective analysis of larger patient groups will be necessary to establish proposed mechanisms of IRIS as diagnostic or prognostic features. In addition, some degree of circular reasoning was unavoidable when the same investigators first diagnosed CWD IRIS and then studied specimens of these patients. In conclusion, the frequently dramatic emergence of IRIS shortly after therapeutic devitalization of T. whipplei (3) emphasizes that in untreated CWD, T. whipplei exerts an immunosuppressive effect on the CD4+ cell system. Previous medicamentous immunosuppression is normally tampered or stopped after the diagnosis of CWD, and successful antibiotic treatment terminates immunosuppression, giving rise to a storm of reactive T cells with increased peripheral and local CD4+ cell counts as early prognostic markers for the development of CWD IRIS. Increased responsiveness of the T cells is not caused by a flare-up of pathogen-specific T cell reactivity; rather, it is due to general recruitment of naive CD4+ T cells exceeding the reconstitution of Tregs. As a consequence of this unbalanced reconstitution with naive CD4+ T cells, activated CD4+ T cells escaping from peripheral blood and homing on to affected tissues are determinants in the clinical presentation of IRIS. We thank Prof. Hans-Heinrich Kreipe (Hannover, Germany) for providing paraffin sections for the stainings of Fig. 1; Andrea Herbst (Neuwied, Germany) for data management; and Diana Bösel, Martina Seipel, Simone Spieckermann, Nadine Gehrmann, and Annett Petrich (Berlin, Germany) for technical assistance. This work was supported by the 5th Framework Program of the European Commission (QLG1-CT-2002-01049) and the Deutsche Forschungsgemeinschaft (KFO 104 and SFB633).
. 2008. Whipple’s disease: new aspects of pathogenesis and treatment. Lancet Infect. Dis. 8: 179–190.
. 2010. Efficacy of ceftriaxone or meropenem as initial therapies in Whipple’s disease. Gastroenterology 138: 478–486, quiz 11–12.
. 2010. The immune reconstitution inflammatory syndrome in whipple disease: a cohort study. Ann. Intern. Med. 153: 710–717.
. 2010. Immune reconstitution inflammatory syndrome in patients starting antiretroviral therapy for HIV infection: a systematic review and meta-analysis. Lancet Infect. Dis. 10: 251–261.
. 2006. Tuberculosis immune reconstitution inflammatory syndrome in countries with limited resources. Int. J. Tuberc. Lung Dis. 10: 946–953.
. 2010. Central nervous system immune reconstitution inflammatory syndrome (IRIS) after hematopoietic SCT. Bone Marrow Transplant. 45: 593–596. Cheng, V. C., W. C. Yam, P. C. Woo, S. K. Lau, I. F. Hung, S. P. Wong, W. C. Cheung, and K. Y. Yuen. 2003. Risk factors for development of paradoxical response during antituberculosis therapy in HIV-negative patients. Eur. J. Clin. Microbiol. Infect. Dis. 22: 597–602.
. 2011. Opportunistic infection-associated immune reconstitution syndrome in transplant recipients. Clin. Infect. Dis. 53: 168–176.
. 2010. Colitis as a manifestation of infliximab-associated disseminated cryptococcosis. Int. J. Infect. Dis. 14: e436–e440.
. 2008. Type 1 helper T cells and FoxP3-positive T cells in HIV-tuberculosis-associated immune reconstitution inflammatory syndrome. Am. J. Respir. Crit. Care Med. 178: 1083–1089.
. 2008. Tuberculosis-associated immune reconstitution inflammatory syndrome: case definitions for use in resource-limited settings. Lancet Infect. Dis. 8: 516–523.
. 2011. Urinary lipoarabinomannan as predictor for the tuberculosis immune reconstitution inflammatory syndrome. J. Acquir. Immune Defic. Syndr. 58: 463–468.
. 2009. Tuberculosis-associated immune restoration syndrome in HIV-1-infected patients involves tuberculin-specific CD4 Th1 cells and KIR-negative gammadelta T cells. J. Immunol. 183: 3915–3923.
. 2010. Elevated frequencies of highly activated CD4+ T cells in HIV+ patients developing immune reconstitution inflammatory syndrome. Blood 116: 3818–3827.
. 2009. Proliferation of weakly suppressive regulatory CD4+ T cells is associated with over-active CD4+ T-cell responses in HIV-positive patients with mycobacterial immune restoration disease. Eur. J. Immunol. 39: 391–403.
. 2011. Circulating inflammatory biomarkers can predict and characterize tuberculosis-associated immune reconstitution inflammatory syndrome. AIDS 25: 1163–1174.
. 2011. Regulatory T cells in patients with Whipple’s disease. J. Immunol. 187: 4061–4067.
. 2002. Dysregulated peripheral and mucosal Th1/Th2 response in Whipple’s disease. Gastroenterology 123: 1468–1477.
. 2006. Reduced peripheral and mucosal Tropheryma whipplei-specific Th1 response in patients with Whipple’s disease. J. Immunol. 177: 2015–2022.
. 2005. Whipple disease: intestinal infiltrating cells exhibit a transcriptional pattern of M2/alternatively activated macrophages. J. Infect. Dis. 192: 1642–1646.
. 2010. Impaired immune functions of monocytes and macrophages in Whipple’s disease. Gastroenterology 138: 210–220.
. 2010. Systemic Tropheryma whipplei: clinical presentation of 142 patients with infections diagnosed or confirmed in a reference center. Medicine (Baltimore) 89: 337–345.
. 2002. Immunohistological detection of Tropheryma whipplei (Whipple bacillus) in lymph nodes. Am. J. Med. 113: 334–336.
. 2000. Cultivation of the bacillus of Whipple’s disease. N. Engl. J. Med. 342: 620–625.
. 2012. Maintenance of peripheral naive T cells is sustained by thymus output in mice but not humans. Immunity 36: 288–297.
. 2011. Intestinal epithelial barrier dysfunction in disease and possible therapeutical interventions. Curr. Med. Chem. 18: 398–426.
. 2005. De novo generation of CD4 T cells against viruses present in the host during immune reconstitution. Blood 105: 2410–2414.
. 2011. Reduced thymic output is a major mechanism of immune reconstitution failure in HIV-infected patients after long-term antiretroviral therapy. Clin. Infect. Dis. 53: 944–951.
. 2006. Different profiles of immune reconstitution in children and adults with HIV-infection after highly active antiretroviral therapy. BMC Infect. Dis. 6: 112.
. 1999. Sequestration of T lymphocytes to body fluids in tuberculosis: reversal of anergy following chemotherapy. J. Infect. Dis. 180: 225–228.
. 2003. Reversal of T cell anergy in leprosy patients: in vitro presentation with Mycobacterium leprae antigens using murabutide and Trat peptide in liposomal delivery. Int. Immunopharmacol. 3: 1589–1600.
. 1999. Induction of HIV-1-specific T cell responses by administration of cytokines in late-stage patients receiving highly active anti-retroviral therapy. Clin. Exp. Immunol. 118: 78–86.
. 2012. Immune reconstitution inflammatory syndrome: the trouble with immunity when you had none. Nat. Rev. Microbiol. 10: 150–156.
. 2009. The HLA alleles DRB1*13 and DQB1*06 are associated to Whipple’s disease. Gastroenterology 136: 2289–2294.
. 2010. Successful treatment of immune reconstitution inflammatory syndrome in Whipple’s disease using thalidomide. J. Infect. 60: 79–82.